Sometimes we take a step forward only to move right back and that is the theme of this post. 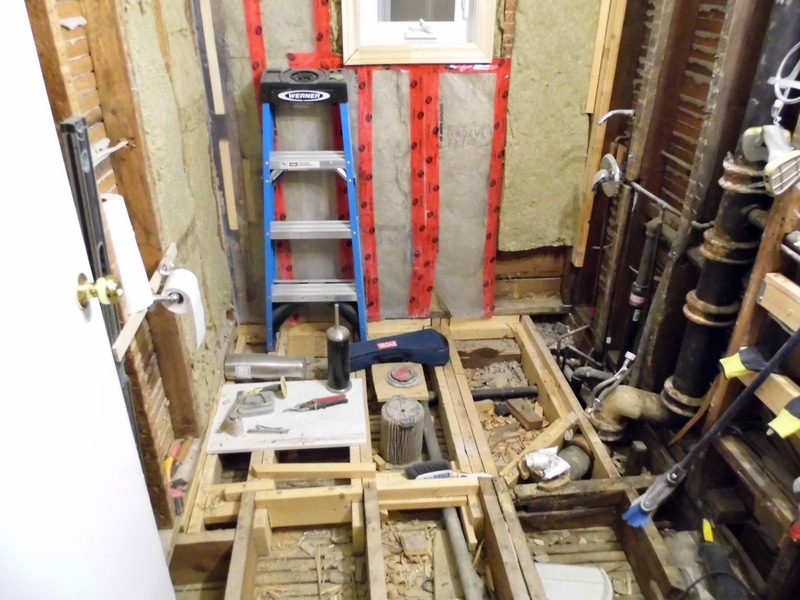 It's been a while since I showed you any bathroom reno updates and part of the reason for this is that we had to take some giant steps back. 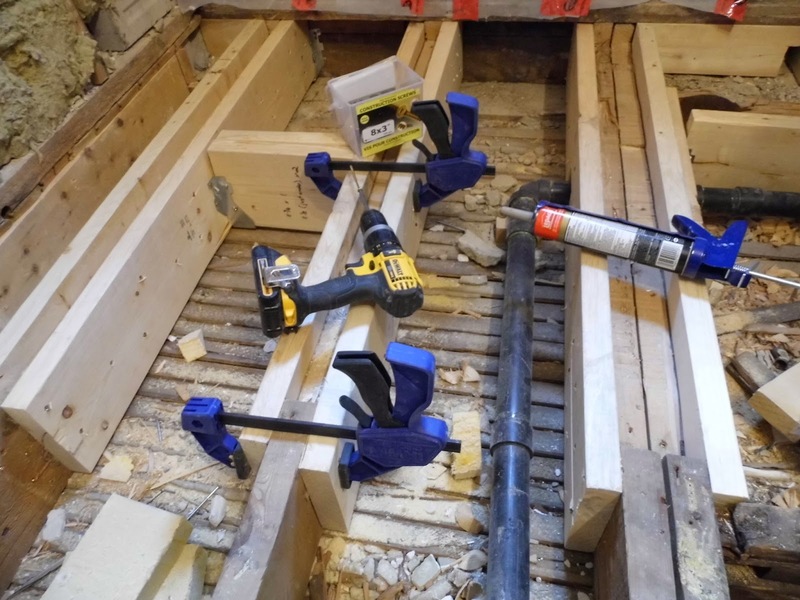 Corey had finished "sistering" the floor joists in order to reinforce them to hold the weight of our heavy iron tub. Keep in mind that, unlike the urban tale of the library that is sinking because it was built without the weight of the books in mind, we are considering the weight of water and people in addition to our tub. Our plumbing fixtures (not easy to find for a traditional clawfoot) arrived in the mail. It was very exciting to see them. 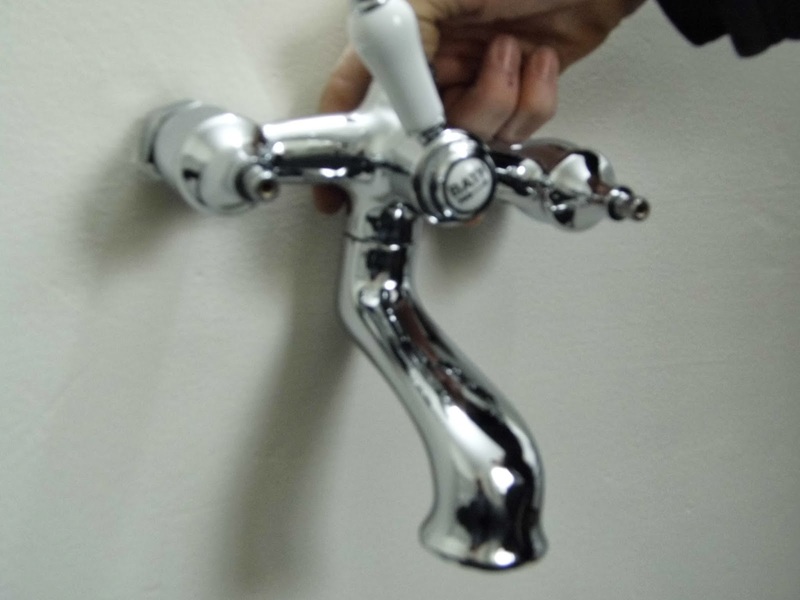 We had deliberately chosen modern chrome fixtures designed with a bit of a nod to the era of the tub. 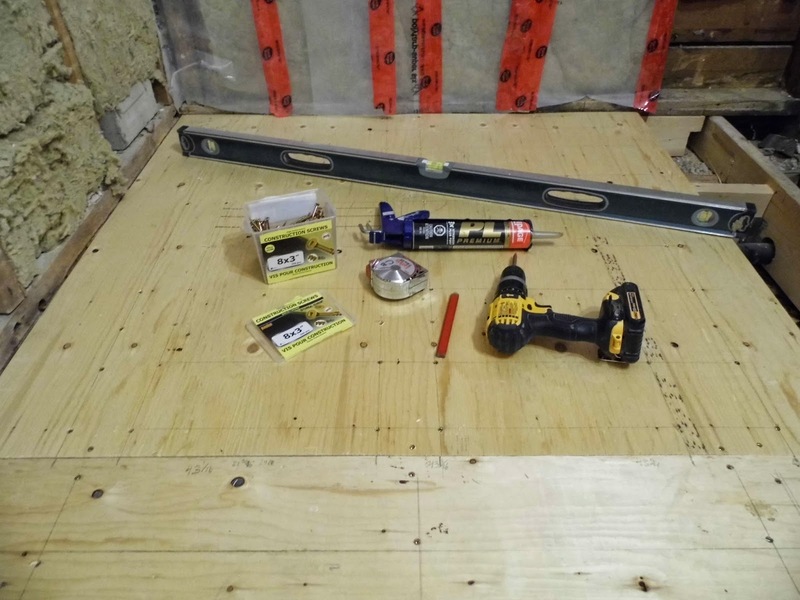 And then Corey began to cut and lay the subfloor. 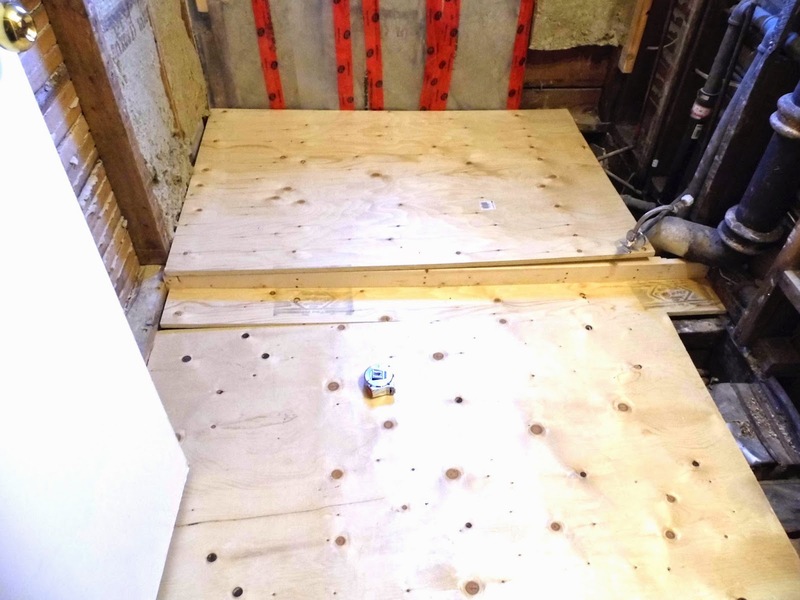 Our engineer and seasoned renovator friends (ahem, Reid and Sascha) will probably notice the mistake in the photos below but I'll tell the rest of you after the photos in case you want to try to look for it. 1. 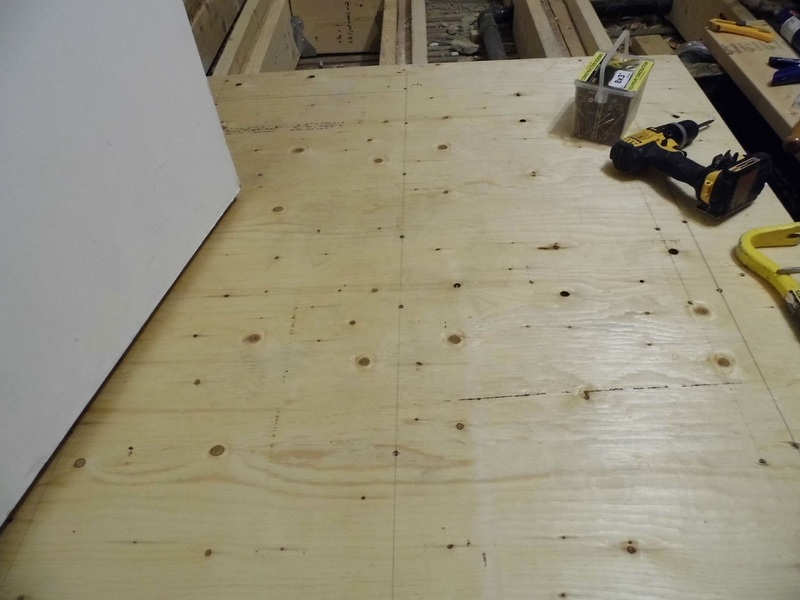 The grain of the plywood should run perpendicular to the floor joists. Shoot! Corey realized that he didn't do either. Luckily, he caught it before we tiled, but it does mean that he had to remove the subfloor and replace it with new plywood. 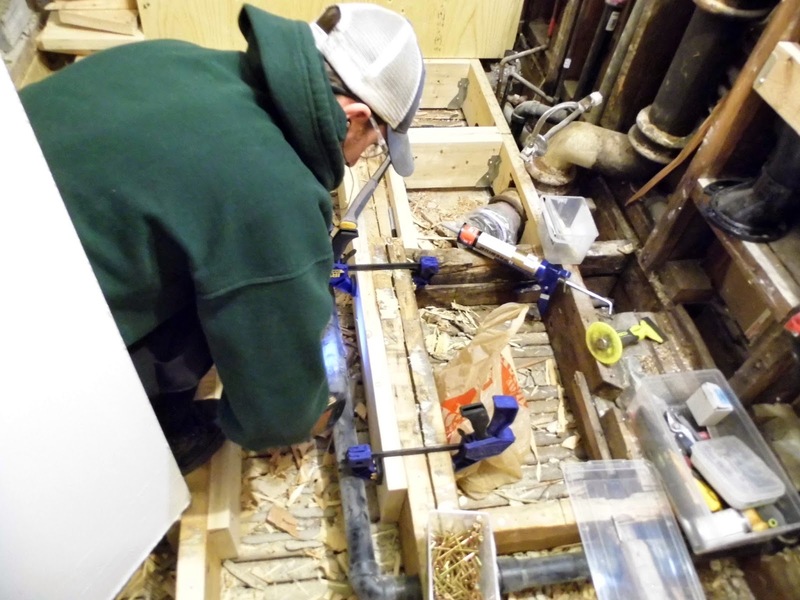 At least it gave him one last opportunity to double check all the joists that he sistered. 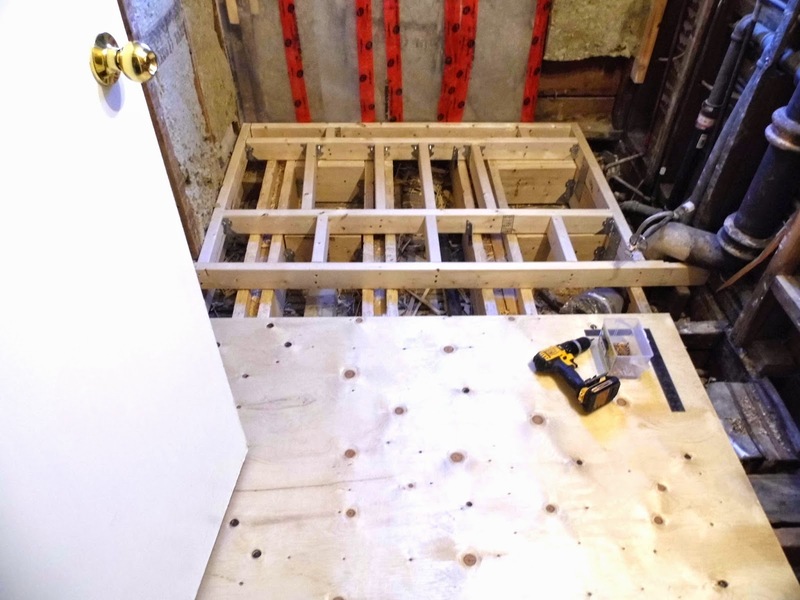 Normally, we wouldn't be quite so concerned and we both think the floor is pretty stable... Just perhaps not quite stable enough to support a 300 pound tub... filled with water... and one or two adults... balanced on tiny feet. See what I mean? You can never be too careful! Poor Corey was a little blue when he realized he had given himself more work, but I'm so proud of him for taking the time to research and fix a mistake. He's the reason our tub won't fall through the dining room ceiling! Friends- give him a pat on the back for it, if you see him! 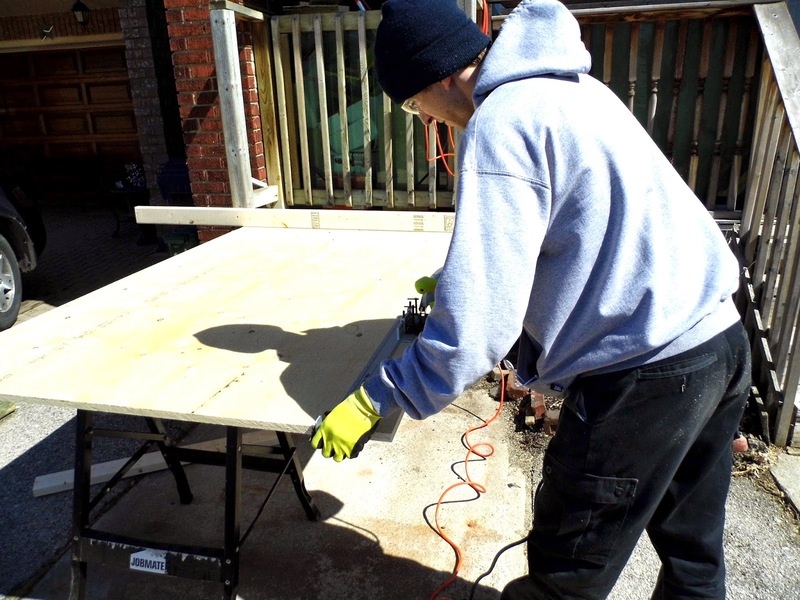 And the opportunity to take a second look gave Corey an idea to offer even more strength. 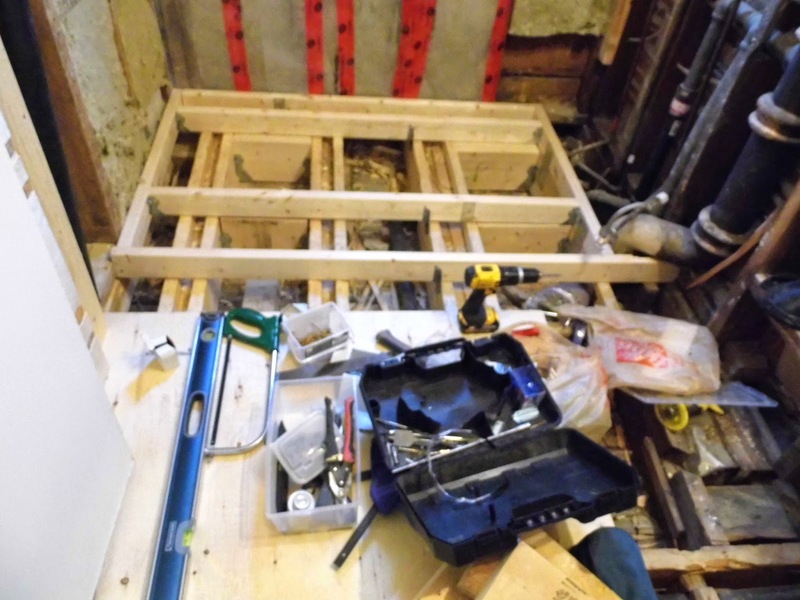 He ended up building a platform, which also serves to allow us to hide some of the pesky plumbing and move the toilet against the wall. 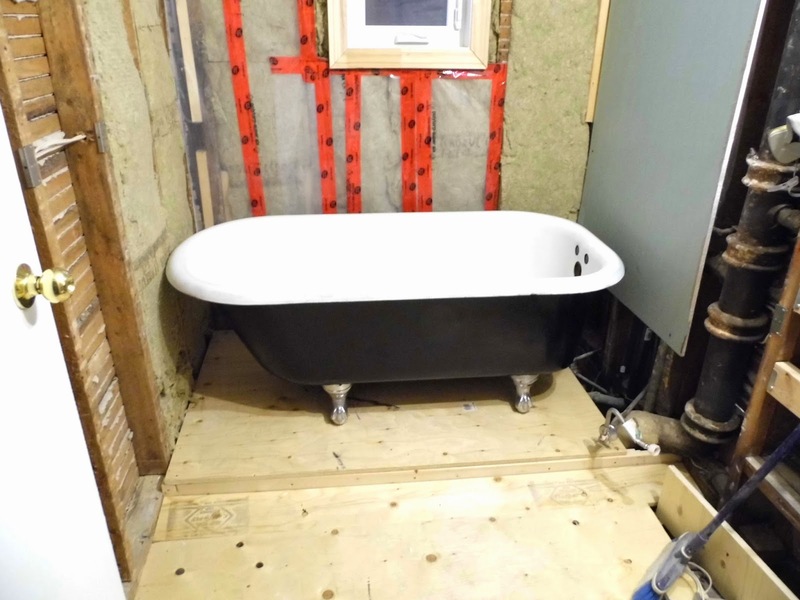 As it happens, I also think this is a great way to draw attention to the feet on our pretty new/old tub. 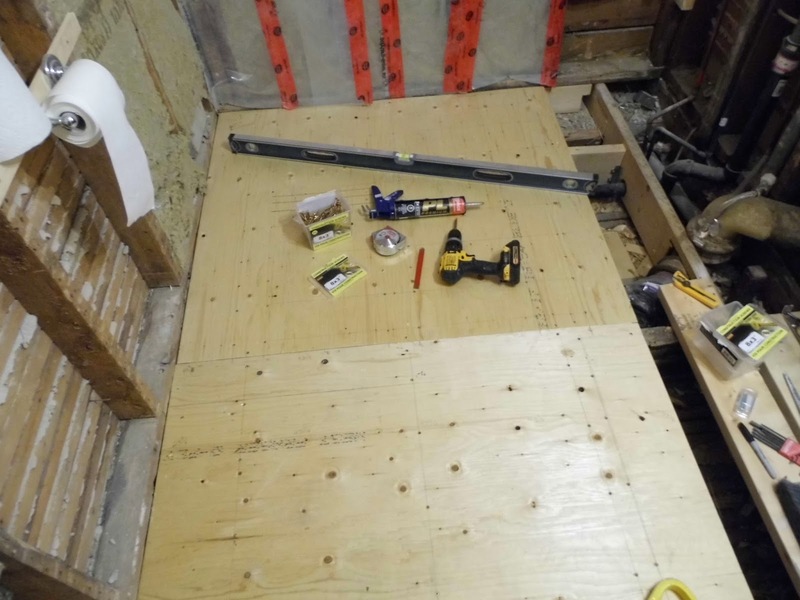 So Corey prepared a new subfloor to be placed the proper way this time. I can't wait to show you guys some of the next highlights. And just remember when you think that everyone's lives on social media seem so perfect and glamorous, that Corey and I are still at this point showering in the family room and running to the basement to use the washroom. If our bathroom isn't finished soon, I'm buying a chamber pot! Not kidding, I think I saw some at the Aberfoyle Antique Market last year.